ALBANY – Alton H. “Al” Carpenter, 87, passed away peacefully on Saturday, May 2, 2015. Al was born on January 29, 1928 on his grandfather’s farm in Kelsey, NY, the son of Adelbert Daniel Carpenter and Ethel LaVonne (Peckham) Carpenter. He spent all of his youth on his parents’ dairy farm in Harpursville, NY until he graduated from high school and joined the Service. He proudly served his country at the end of WWII and again during the Korean Conflict and was honorably discharged from the U.S. Army Air Corps, and the U.S. Air Force. After discharge from the Air Force, he worked for over 30 years at Bendix Corporation in Sidney NY as a Systems Analyst and returned to live for many years in his hometown of Harpursville NY and raise his family. 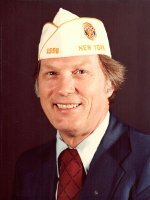 After retiring from Bendix at age 55, he moved to Albany NY and began working, first as a consultant, then full time as the Administrative Office Assistant to the Adjutant for the NYS American Legion Headquarters in Albany, N.Y. He was a Lifetime Member of the American Legion Post 1596 in Harpursville, NY serving as Post Commander, NYS Department Commander and National Historian. He was always a dedicated advocate for veterans and their families, lobbying in both New York State and Washington DC for veterans services and benefits—and was at a meeting in Washington DC on September 11, 2001, meeting with members of Congress on behalf of Veterans. He was a longtime member of the Albany Redmen Bowling League and as team captain, led his team to first place in the 2014-15 season. He was an avid Outdoorsman who loved hunting and fishing, a proficient horseshoe player, but mostly just loved being outdoors. Al is survived by his children, LaVonne Button, William (Cheryl Randall), Gerald, Jeffrey and Brian Carpenter (Andy Taylor), Dona Eckert, (Tony), and stepchildren Michael Whitaker, Cheryl Whitaker (Bernie Mackey), and Diane Kilmer (Kevin); his grandchildren, Tonya, Amber (Paul), Megan, Kameron (Noelle), Kollin, Joelle (Jeremy), Mark and Victoria, several great grandchildren, a niece Rachel Westcott-Lawler (Bob), and his dear friend of many years, Ann Geer. He was predeceased by his father and mother and his beloved younger sister Anna Mae Bert (Kenneth). Al and his family would like to express their deepest appreciation for the doctors, nurses and staff at the Stratton VA Hospital for their compassion and expert medical care he received over the years, including dialysis, cardiology and the ICU in the later stages of his care. Funeral services will be held in the Hans Funeral Home, 1088 Western Ave., Albany, Wednesday evening at 7:00 pm. Relatives and friends are invited, and may call at the funeral home Wednesday from 4-7 pm. Inurnment in the Gerald B.H. Solomon Saratoga National Cemetery in Schuylerville, NY, will be held Friday, May 8th, at 10:00 am. In lieu of flowers donations may be made to DAV, the Disabled American Veterans, Payable to DAV — Disabled American Veterans, P.O. Box 14301, Cincinnati, OH 45250-0301 or call 877-647-VETS. To leave a message of condolence for the family or obtain directions to the funeral home, please visit www.HansFuneralHome.com . Al was a special friend and will be missed dearly. We first met when he was Department Commander and he became a mentor to me. RIP my friend. Our condolences to his family and Ann. I am very saddened by the loss of Cousin Alton. My dad ( Charles L. Crisman)who was a 1st cousin ,spoke very highly of and admired Alton. I had the fine opportunity to meet with Alton and some of his children 1 1/2 yrs ago in Hancoc, NY and then spend an afternoon with him going over old Carpenter family letters and photos . It was such a nice visit getting to know Alton and to share family times of years gone by. I would have liked to have known him better. He was a dedicated serviceman and highly respected. May he rest in peace. Blessings and prayers to family members. My Most Heartfelt Condolences to the Family of Alton Carpenter, a Post 1596 Brother Legionnaire, Friend and Fellow U.S. Military Veteran. Rest In Peace. My condolences to Ann and also to Al’s family. Al was a very dedicated Veteran and a good friend for many years. Al will be thought of with found memories forever. Rest in Peace my friend. Al will be missed by many. Not only was he a gentleman and a friend he was a highly respected Legionnaire. Al, you will certainly be missed.. Many many memories of times spent together by our families. Prayers for your family in this time and eternal peace to you our friend. He was truly a member of the greatest generation. His family can be proud of him. My sincere condolences to the Carpenter Family. So many memories spending time with you as a kid growing up. Your Dad did great things for the Veterans of our country and as my Son has now entered the Army National Guard, that means even more to me. Thoughts and Prayers with you . My sincere sympathy to all the family. Alton was a special cousin who reminded me of my Dad (his Uncle Harlan). We enjoyed several visits with him during recent years that will leave many pleasant lasting memories. He will be greatly missed. My deepest sympathy to all of Al’s family, some of whom are cousins of mine. Al was so well liked and respected by so many and I know you were all very proud of him. You will be missed, my friend. Rest in Peace. Al will be missed. He was a good friend and mentor. He was a outstandind Legionnaire. My condolences to the Carpenter family. I am so sorry for your loss. Your dad was very special to me .I have known him since I was a child .I have many fond memories. I had spent many hours at your house. .My heart reaches out to each of you !! !Love You All Love Luann. It is with heart-felt joy that I read all the wonderful messages of condolence from so many of his life long friends and neighbors. I too have wonderful memories of the times spent not only as a child but also as an adult when we would travel the state or just sit and talk at one of his favorite spots—- the deck overlooking the flower garden in his back yard listening to the birds.. He taught me so much about life and was a wealth of knowledge in many areas- especially history. I truly believe history was his passion which is the reason he became the National Historian in 1976 for our Country’s Bi-Centennial. Dad was always willing to share what he knew with the entire world- all you had to do was start up a conversation with him. I want to thank everyone for their kind thoughts and fantastic experiences they shared concerning my dad during his entire life. Dad, you will always be in my thoughts, my heart, my soul. I love you!